It is unknown form where TearHare originated. They are traded privately between Tamers and seem unfit for a natural habitat. Their skin appears to be a thin, soft, leathery fabric that could be easily torn. Despite their inoffensive bodies, they possess a dark magic that can inflict terrible pain on a foe. Humans that have experienced this through either self-experimentation or by an attack from a criminal have described a bleak, totally encompassing crushing pain, while others have described a sensation that they are being poked and prodded like a voodoo doll. The specific type of pain inflicted seems to be out of the hands of the Tamer, left to some dark creative license. 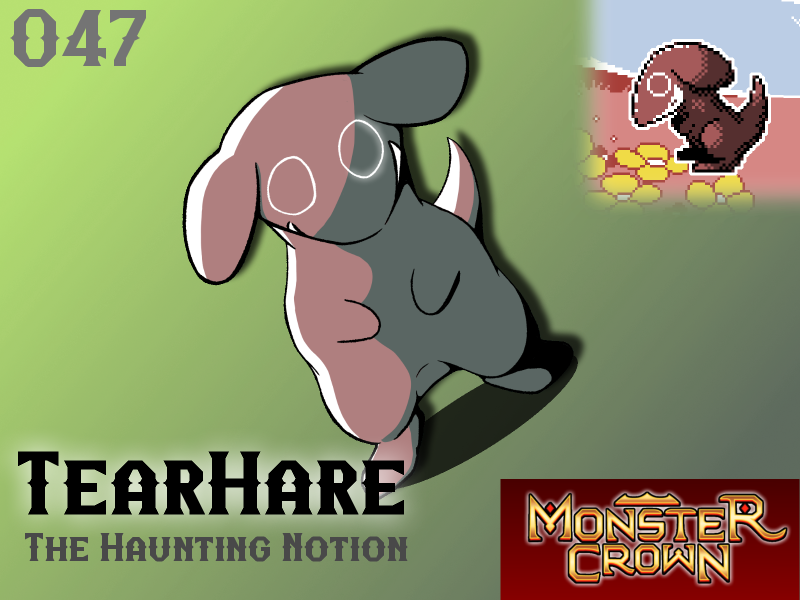 Tamers that make use of TearHare's skills to excess report being visited by dark nightmares. In these nightmares an image of TearHare appears with a torn fabric-skin. From the darkness within, vile insects, howling voices or terrible visions are seen inside. These dreams haunt the Tamer, wearing them down over time and leading to a mental exhaustion that is beyond cure. It is unclear if this is a property of TearHare, or a manifestation of a deep-rooted guilt. Will TearHare make your team?